Background/Aims: To assess the accuracy of transient elastography (TE) in the prediction of esophageal varices (EV). Materials and Methods: The literature search was conducted by using PubMed, EMBASE, Web of Science, and CENTRAL on The Cochrane Library without time or language restrictions. Terms used were "FibroScan," "transient elastography," "stiffness," and "esophageal varices." The pooled sensitivity, specificity, and other parameters were obtained using a bivariate mixed-effects regression model. Result: Twenty studies (2530 patients) were identified for inclusion. The pooled sensitivity, specificity, positive and negative likelihood ratios, and diagnostic odds ratio were 0.84 (95% confidence interval [CI], 0.79-0.87), 0.68 (95% CI, 0.61-0.73), 2.58 (95% CI, 2.15-3.10), 0.24 (95% CI, 0.19-0.32), and 10.60 (95%CI, 7.20-15.62), respectively. The summary area under receiver operating characteristics (AUROC) curves was 0.82 (95% CI, 0.79-0.86). Especially, for hepatitis C patients, the diagnostic performance of TE for detecting the presence of EV was similar to all other patients with a sensitivity of 0.83 and a specificity of 0.63, but without heterogeneity (I2 = 0.00). For the prediction of large esophageal varices in patients with viral liver cirrhosis, the pooled sensitivity and specificity of TE were 0.82 (95% CI 0.74-0.89) and 0.77 (95% CI 0.65-0.85), respectively, without significant heterogeneity (I2 = 0.00). Conclusion: Transient elastography has good sensitivity and moderate specificity. TE can be used as an effective noninvasive screening tool for the prediction of esophageal varices, especially in hepatitis C patients, and for the prediction of large esophageal varices in patients with viral liver cirrhosis. Background/Aim: Over the past two decades, several advances have been made in the management of patients with hepatocellular carcinoma (HCC) and portal vein tumor thrombosis (PVTT). Yttrium-90 ( 90 Y) radioembolization has recently been made a treatment option for patients with HCC and PVTT. However, there is still a need to systematicly evaluate the outcomes of 90 Y radioembolization for HCC and PVTT. We aimed to assess the safety and effectiveness of 90 Y radioembolization for HCC and PVTT. We performed a systematic review of clinical trials, clinical studies, and abstracts from conferences that qualified for analysis. 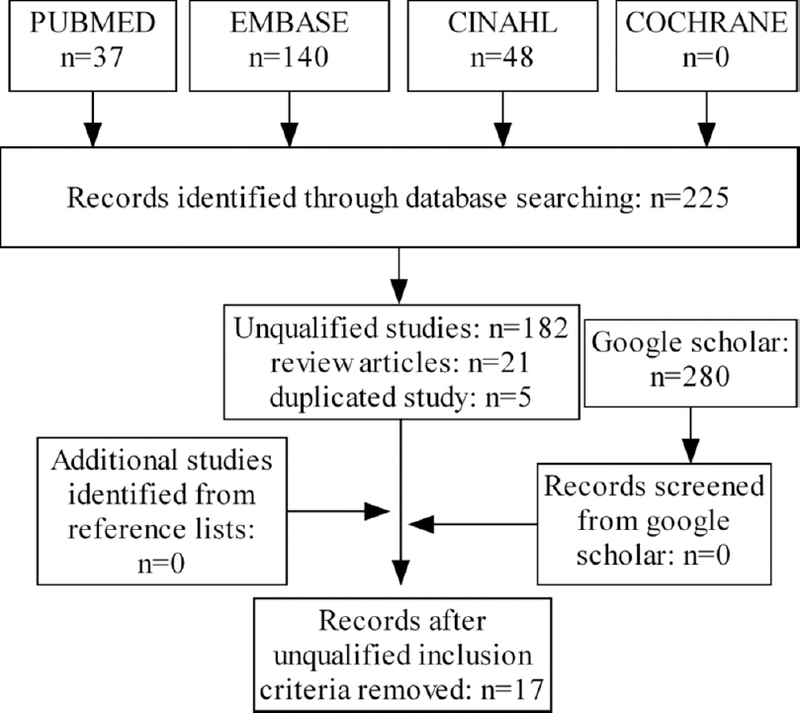 Materials and Methods: PubMed, EMBASE, Cochrane Database of Systematic Review, CINAHL, and the "gray" literature (Google Scholar) were searched for all reports (1991-2016) related to 90 Y radioembolization for HCC and PVTT. Results: A total of 14 clinical studies and three abstracts from conferences including 722 patients qualified for the analysis. The median length of follow-up was 7.2 months; the median time to progression was 5.6 months, and median disease control rate was 74.3%. Radiological response data were reported in five studies, and the median reported value of patients with complete response, partial response, stable disease, and progressive disease were 3.2%, 16.5%, 31.3%, and 28%, respectively. The median survival was 9.7 months for all patients, including the median overall survival (OS) were 12.1, 6.1 months of Child-Pugh class A and B patients, and the median OS were 6.1, 13.4 months of main and branch PVTT patients, respectively. The common toxicities were fatigue, nausea/vomiting, abdominal pain, mostly not requiring medical intervention needed no medication intervention. Conclusions: 90 Y radioembolization is a safe and effective treatment for HCC and PVTT. Background/Aims: Same-day bidirectional endoscopy (BDE) is a commonly performed procedure, but the optimal sequence of the procedure with carbon dioxide insufflation is not well established. In this study, we investigated the optimal sequence for same-day BDE without polypectomy under moderate sedation and carbon dioxide insufflation in terms of sedation doses and colonoscopy performance. Patients and Methods: We performed a prospective observational study of 63 asymptomatic patients who were admitted for physical check-ups. A colonoscopy-esophagogastroduodenoscopy (EGD) examination was performed first and then an EGD-colonoscopy examination was performed within 1.5 years. Results: The total procedure time, procedure complexity, bowel preparation quality, cecal intubation time, colon polyp detection rate, and adverse events were similar between the two study groups. The total doses of fentanyl and midazolam were significantly higher for the colonoscopy-EGD group than that for the EGD-colonoscopy group (70.8 ± 9.6 μg vs. 56.6 ± 9.2 μg and 6.1 ± 1.3 mg vs. 4.6 ± 1.1 mg, P < 0.0001 and P < 0.0001, respectively). The recovery time to discharge was significantly longer for the colonoscopy-EGD group compared to the EGD-colonoscopy group (38.5 ± 3.9 min vs. 31.9 ± 3.2 min, P < 0.001, respectively). Conclusions: EGD-colonoscopy is the optimal sequence for same-day BDE. In this order, the procedures are better tolerated, the sedation doses are reduced, and the recovery time is shorter. Background/Aim: Increasing resistance of Helicobacter pylori to antimicrobials necessitated the development of new regimens and the modification of existing regimens. The present study aimed to compare the efficacy of two bismuth-containing quadruple regimens-one including clarithromycin (C) instead of metronidazole (M) and triple therapy. Patients and Methods: Patients with H. pylori infection given the following regimens were sequentially enrolled in this retrospective study: (1) Triple therapy: Lansoprazole 30 mg b.i.d., clarithromycin 500 mg b.i.d., and amoxicillin 1 g b.i.d., (2) bismuth group C: Lansoprazole 30 mg b.i.d., clarithromycin 500 mg b.i.d., amoxicillin 1 g b.i.d., and bismuth subsalicylate 524 mg b.i.d., and (3) bismuth group M: Lansoprazole 30 mg b.i.d., amoxicillin 1 g b.i.d., metronidazole 500 mg t.i.d., and bismuth subsalicylate 524 mg b.i.d. for 14 days. Gastroscopy and 14 C-urea breath test were performed before enrollment, and urea breath test was repeated four weeks after the treatment. Results: At per-protocol analysis, the eradication rates were 64.7% (95% confidence interval 60.4-68.7) with the triple therapy (n = 504), 95.4% (95% confidence interval 91.5-99.4) with the bismuth group C (n = 501), and 93.9% (95% confidence interval 89.7-98.7) with the bismuth group M (n = 505). The eradication rates were similar between the two bismuth groups (P > 0.05) but significantly greater than that of the triple therapy (P < 0.05). Conclusion: In our study, both of the bismuth-containing quadruple therapies reached high eradication rates, whereas triple therapy was shown to be ineffective. Moreover, clarithromycin may also be a component of bismuth-containing quadruple therapy. Background/Aim: To elucidate colorectal cancer (CRC) disease patterns, demographics, characteristics, stage at presentation, metastases, and survival rates of patients, particularly those with liver metastases, at our center as the first report from the Kingdom of Saudi Arabia. Patients and Methods: We performed a retrospective, single-center database study based on the histological diagnosis of CRC in patients seen at the King Khalid University Hospital between 2007 and 2011. Results: 427 cases of CRC with a mean age at diagnosis of 55.47 ΁ 12.85 years, out of which 96% were resected. Stage II was predominant at presentation, followed by both stage III and IV, with the remainder being stage I. One hundred patients had distant metastases, of which the liver was the only location in 54 patients. Mean survival was 3.0 years. Overall survival rates for CRC patients with liver metastases who underwent resection were 30% at 2 years and 17% at 5 years, and the mean survival rate was 1.4 years. Conclusions: Both the mean survival rate of our CRC patients with resectable liver metastases and the 5-year survival rate of these patients are lower than global averages. This discrepancy is likely due to late diagnoses rather than more aggressive disease. Background/Aim: The aim of this study was to assess the role of serum pigment epithelium-derived factor (PEDF) and matrix metalloproteinase-9 (MMP-9) in progression of liver cirrhosis and development of hepatocellular carcinoma (HCC). Patients and Methods: Serum levels of PEDF and MMP-9 were tested in 212 patients with liver cirrhosis and in a control group of 30 healthy volunteers. HCC was diagnosed in 45 of the 212 patients studied (21%). Results: Serum PEDF and MMP-9 were higher in the study group than that in the control group (P < 0.001). In patients with alcoholic or mixed (alcoholic and viral hepatitis-related) cirrhosis, serum PEDF was higher than that in other patients (13970.2 ± 13406.9 ng/ml vs. 8563.5 ± 9602.7 ng/ml, P = 0.008). In patients with viral hepatitis-related cirrhosis, significantly higher PEDF levels were recorded in those with HCC (13429.1 ± 12045.8) than that in patients without HCC (6660.1 ± 7927.1; P = 0.04). There was a trend for higher serum MMP-9 in patients with HCC (5778.7 ± 12426.6 vs. 1389.8 ± 1944.7 in those without HCC; P = 0.07). Significant negative correlation between serum MMP-9 and serum alpha-fetoprotein in patients with HCC was observed (r = −0.54; P = 0.04). Conclusion: Serum PEDF and MMP-9 could be auxiliary markers in diagnosis of HCC, especially in patients with low alpha-fetoprotein level. Alcohol consumption can affect serum PEDF. Background/Aims: Complications are important determining factors for safety of endoscopic submucosal dissection (ESD) for gastric heterotopic pancreas (HP). 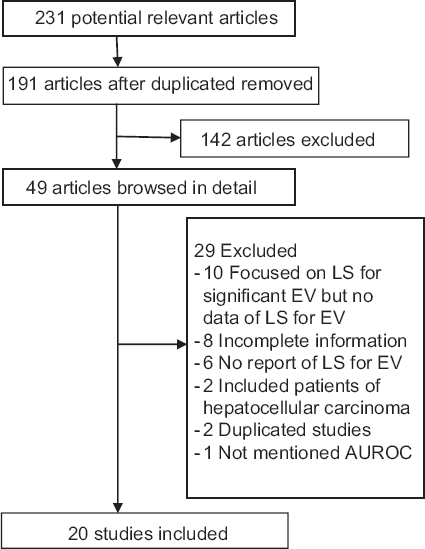 This study investigated whether endoscopic color Doppler ultrasonography (ECDUS) could be used to predict the feasibility, efficacy, and safety of ESD. Patients and Methods: The study included 52 patients with heterotopic pancreas of the gastric antrum who underwent ECDUS before ESD. ECDUS was used to evaluate the submucosal vascular structure and the location of HP in gastric wall. The patients who had a vessel at least 500 μm in diameter or at least 10 vascular structures per field of view were classified into the rich group (Group R), and others were classified into the non-rich group (Group N). Procedure time, decrease in hemoglobin, frequency of clip use, complications, recurrence rate, and others were retrospectively evaluated. Results: There were 18 patients in Group R and 34 patients in Group N. Mean procedure time was significantly longer in group R (55.4 min) than in group N (35.5 min) (P = 0.014). The incidence of muscle injury and clip use were significantly higher in group R (77.8/83.3%) than in group N (20.6/23.5%) (P < 0.05). 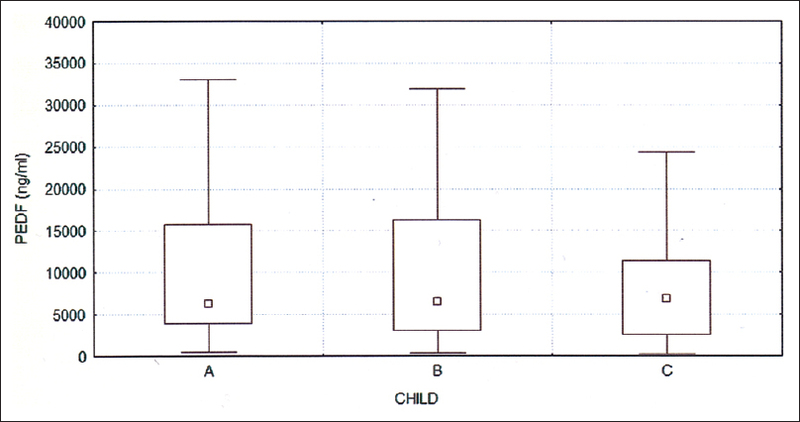 Mean decrease in hemoglobin was 2.5 g/dL in group R and 2.4 g/dL in group N, with no significant difference. There were no recurrences in any cases during the follow-up period. Conclusion: Preoperative identification of submucosal vascular structure by ECDUS can predict procedure time and the incidence of muscle injury and clip use, which is particularly suitable for predicting ESD safety in heterotopic pancreas of stomach. Background/Aim: The efficacy of flexible spectral imaging color enhancement (FICE) ch. 1 (F1) for the detection of ulcerative lesions and angioectasias in the small intestine with capsule endoscopy (CE) has been reported. In the present study, we evaluated whether F1 could detect incremental findings in patients with no findings in a standard review mode. 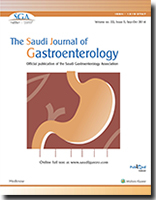 Patients and Methods: In total, 52 patients (age: 60.1 ± 15.3 years; 30 males) with obscure gastrointestinal bleeding (OGIB) who underwent CE and in whom no lesion was detected in the small intestine in the standard mode (first review) were enrolled. Two experienced endoscopists independently reviewed CE videos again by F1 (second review). The following findings were defined to be significant: Ulcers, erosions, aphthas, angioectasias, tumors, and bleeding. Incremental findings at the second review were checked at F1 and in standard mode by the two reviewers (third review). Finally, the findings were confirmed by the agreement of the two reviewers at the third review. 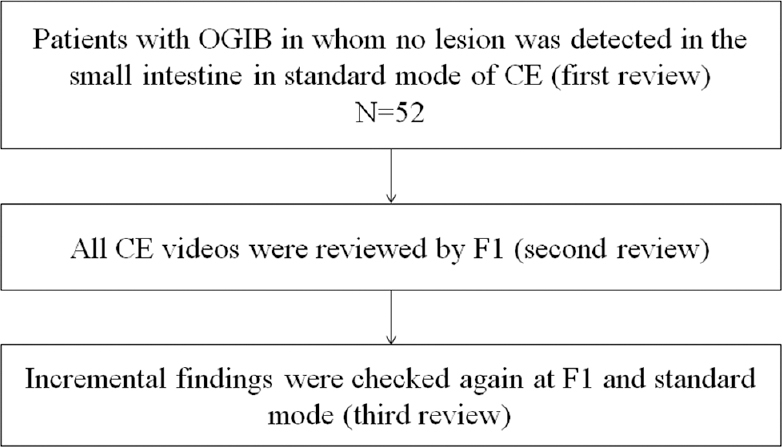 Results: F1 detected five significant lesions in three patients with overt OGIB; three erosions, one aphtha, and one angioectasia. For nonsignificant lesions, F1 detected 12 red mucosas and 16 red spots. Moreover, 29 patients with 71 findings were considered false positives. Conclusion : F1 detected incremental significant findings in a small percentage of patients with no findings in the standard review mode. In addition, F1 showed many false-positive findings. The incremental effect of a repeated review by F1 in patients with no findings in the first review is limited. Gastrointestinal sarcoidosis is a rare disease with very limited data in children. Here we report the first pediatric case of successful treatment with infliximab. The first case was an 8-year-old Saudi girl who presented with fever, weight loss, and abdominal pain that was followed in a few months with hematemesis and development of hepatosplenomegaly. The second case was a 9-year-old Sudanese boy who manifested with vomiting, epigastric pain, and weight loss. On upper endoscopy, both cases demonstrated severe erosive nodular gastric mucosa. 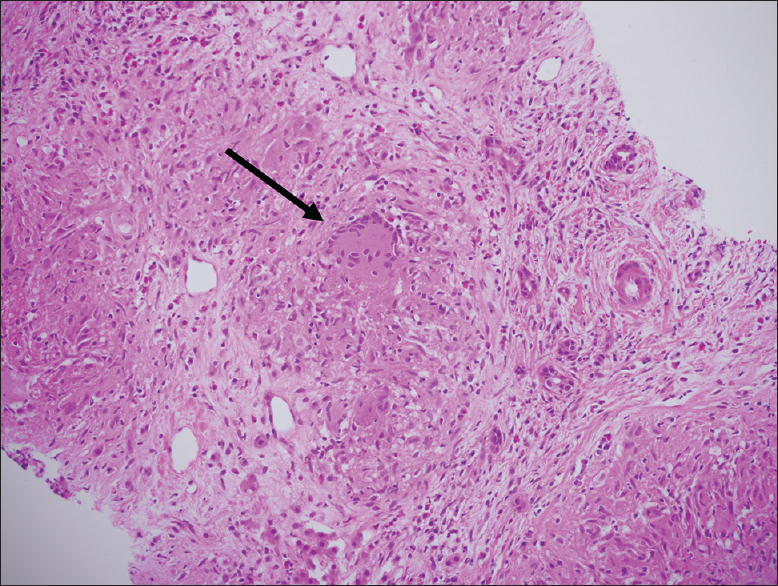 Gastric and esophageal biopsies had shown noncaseating granulomatous inflammation. The first case had histopathological evidence of granulomatous hepatitis, and both cases demonstrated lung nodularity on computed tomography chest. The boy had elevated angiotensin-converting enzyme level. Given the multisystem involvement with significant chest findings, tissue findings of granulomatous disease, and negative workup for other causes of granulomatous inflammation, both cases were diagnosed with active disseminated sarcoidosis, and treated with corticosteroids. The girl continued to be symptom-free for 4 years after tapering steroid therapy. The boy had relapses off steroids and the disease was brought into remission for 5 years off steroid therapy by infliximab. Pediatric GI sarcoidosis is a rare disease that exhibits heterogeneity in natural course. The chronic relapsing progressive form of the disease might benefit from infliximab therapy.